2002 Chevy Malibu 3.1L with almost 200k miles. Driving the other day check engine light started flashing. At the red light idle is pretty rough. Got home and checked it with the scan tool and says it has a misfire in cylinder 5. So far I've changed all the plugs and wires, switched coil packs, switched fuel injectors and always get the same thing. What else could be the problem? They were all really bad and corroded, it didn't look much different than the others though. 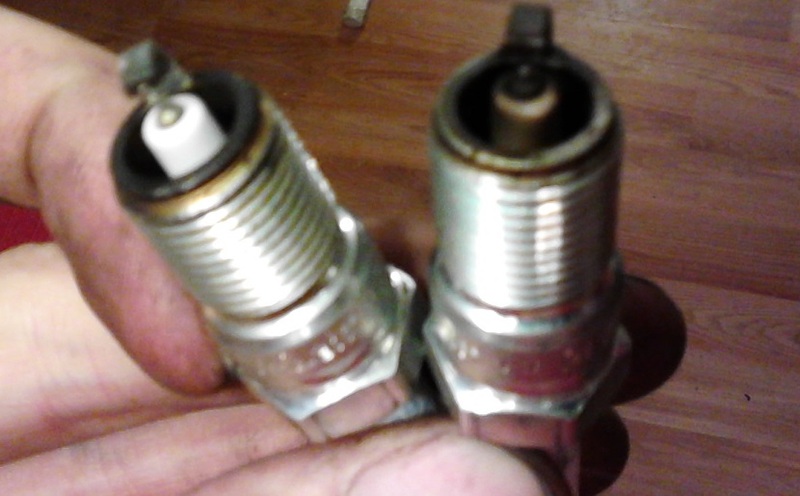 Well, reading the plugs is how you determine if you are dealing with an ignition problem or a fuel problem. Well, I swapped the coil packs and injectors. Wouldn't that move the misfire to another cylinder? I couldn't tell much from the plugs. That eliminates a few components but you still don't know if you're dealing with a fuel problem or a spark problem and that's the first thing you need to determine. You might be able to use a spark tester to determine that. Which cylinder did the one on the right come out of? ....................................Also the one on the left for that matter. Cylinder 5 on the right, cylinder 2 on the left. OK, looks like you have an ignition problem then. If you have swapped the coils around and the miss didn't move, you may have a bad ignition module, assuming the wires are good and in the correct order. All brand new wires and did swap the coils. I assume you have checked compression already, right?